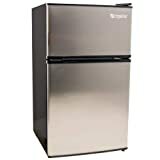 Compact size refrigerators can be extremely handy for small homes or as an extra appliance in a home bar or game room. Many college students use a small size fridge to keep fresh groceries in their dorm room saving on food costs. This list of the Top 5 Best Counter Depth Refrigerators of 2018 offers a range of choices depending on the desired style and budget. Whether you are looking for a separate fridge and freezer to combo or want a model that saves on energy costs this list offers a choice for you. 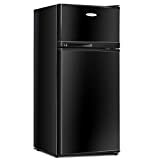 All of these refrigerators are under $250.00 keeping them budget friendly. Are you looking for a fun way to add style to your college dorm room or home game room? 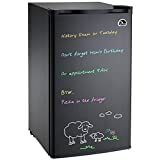 This mini fridge is coated in an erase board surface making it fun to draw, leave notes, or stay organized on a practical home appliance. 3.2 cubic feet of interior storage space is designed to accommodate large two-liter drink bottles. A small freezer holds ice cube trays. Black color complements modern style designs and looks great when used with neon dry erase markers. Easy to clean, removable glass shelving can be adjusted to accommodate larger items. This fridge and freezer combo gives users away to keep food fresh and close at hand even in tight storage areas. The lower 2.2 cubic foot fre]ideg features removable glass shelving and a crisper drawer helping keep contents organized. The upper freezer offers 1.1 cubic feet of storage accommodating ice cream tubs with ease. Many compact size fridges only offer a tiny freezer compartment but this model by Cost way makes storing frequently used frozen goods easy to access. Perfect for a college dorm room or family bar. Unlike some other models, this fridge by Danby features lightweight, durable glass shelving helping to keep food well organized and fresher for longer. With 4.4 cubic feet of interior space, this compact fridge can accommodate larger items with ease. The counter height allows for homeowners to seamlessly add this refrigerator to a mini bar area or game room. Reversible door swing allows users to change the door orientation based on the area of use. Danby offers a sleek, modern black color that helps hide spills and resist fingerprints. A cycling defrosting system keeps the fridge working well and reduces ice buildup inside and on food. This compact size fridge offers the added benefits of a separate freezer and fridge. The upper freezer compartment makes keeping ice and ice cream close at hand easy for the next party or any dorm room needs. Cost way aims to offer consumers reasonably priced appliances that offer reliable quality for years of use. 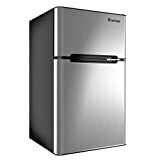 Many compact size appliances are loud making them difficult to share a room with, this refrigerator is different. Removable glass shelving makes organization and cleaning easier. The black interior helps resist fingerprints and dirt keeping this appliance looking great in any room of the home. 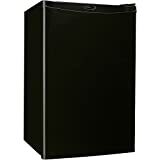 Edgestar offers a neat and tidy compact size freezer, fridge combo offering 3.1 Cubic Feet of storage. Energy Star rated this appliance will reduce energy costs without compromising food freshness or flavor. Reversible door mounts allow users to customize this fridge to fit into any space without having door issues. Both the refrigerator and freezer features door storage compartments helping keep food separate. The combination of an interior wire shelf and a glass shelf along with a vegetable crisper drawer allows storage options for any type of food. Brushed stainless steel with black detailing makes this appliance by Edgestar a stylish option for any dorm room or home.